The performance review was only made available to councillors under “controlled supervision” last month, five months after its completion. 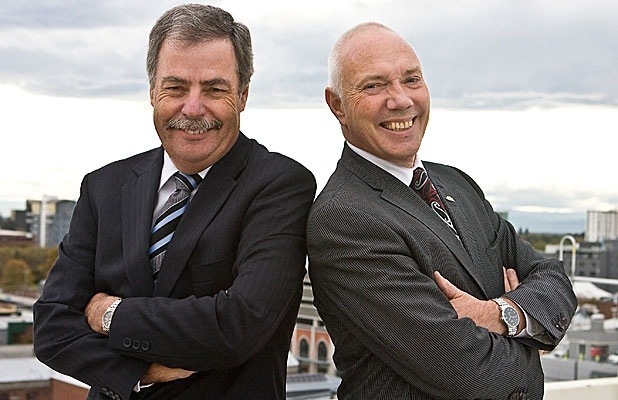 Councillors are able to read the document under supervision in Mayor Bob Parker’s office and are not able to take notes or copy it. So if you weren’t one of the councillors on the committee, you could only read the report under close supervision in Bob’s office, with the lizard king himself looming over you as you read? At this stage, it’s hard to see whether this is a symptom or a cause of the dysfunction at Council. It’s been a pretty extraordinary week for Christchurch politics, and we’ve seen our fair share of those in the last few years. I think you can trace back the unravelling to the dismantling of ECan, which brought the heavy hand of government into the day-to-day running of the city. Ever since then, it’s been apparent that the government wasn’t going to shy from doing things that were unprecedented. As chair of the Canterbury Mayoral Forum, Bob Parker was responsible for a letter from that body to the government, requesting that they intervene in a “dysfunctional” ECan. Just over three years later, Parker is trying to slide out the door with his political reputation in tatters, after presiding over a council that made ECan look like a textbook example in local governance. in which commentators from outside the city explain to the rest of us what’s going on here. It’s bang on the money. Tony Marryatt goes on “gardening leave”, and we get David Farrar and Bryce Edwards to tell us all about it. Who’s going to run in Christchurch East? Why don’t we ask Farrar, John Armstrong, Matthew Hooton, WhaleOil. On it goes. I don’t know what sort of experience those guys (guys, it’s always guys) have with Christchurch, before or after the quakes, but this isn’t politics as usual. Analysis as usual just won’t do. A couple of months ago, I asked Bryce Edwards, who compiles the very useful NZ Politics Daily blog for the Herald, why there weren’t more pieces on Christchurch. He replied that there quite simply wasn’t much debate on it. By and large, he’s right. I write this blog because I see a void where analysis on Christchurch should go. I’m left-wing and a member of Labour Party – but then, being associated with National hasn’t stopped Farrar, Slater and Hooton setting the discourse for the mainstream media. 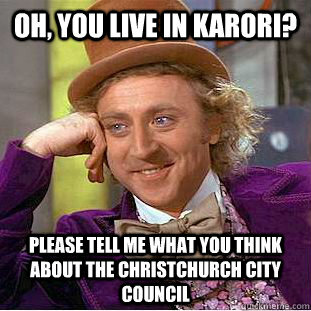 I don’t see a huge number of other Christchurch-focussed blogs – though link me to them if I’m missing some out. There is a politics department at the University of Canterbury (at least, there is at the moment) and I’m sure lecturers there could be asked to comment. Bronwyn Hayward is one example, though they only seem to ask her about school closures. Glenn Conway, the chief reporter from the Press, has written some very good opinion pieces, one of which I linked to earlier in the week. He appears in this segment on the Nation, to talk about Parker’s resignation and the media coverage. He’s also written this article that borders on a eulogy. Probably the best outlet for discussion and analysis of the quakes currently is From the Streets, a 13-part panel/documentary show that’s been put together by Gerard Smyth (disclosure; I’m a panellist in a couple of episodes). The show format has three pre-recorded clips, which speak to the theme of the particular episode (heritage, consultation, the bcd etc) which are interspersed with short segments where three panelists discus the issues raised in the clip. It screens on CTV, which is on free view if you’re in Christchurch, but you can also find all of the clips online. I can’t recommend it highly enough – and not just for Cantabrians, but the whole country. You’re all paying for this rebuild – you might as well see what’s going on, and what we have to say about it. So much of the rebuild seems to have been taken out of our hands already. The media could at least let us have our own opinions and analysis of it.